The energy was high in the Clarkston High School gym as the Wolves and Bloomfield Hills volleyball teams battled for points in the fourth match. The Clarkston Varsity Volleyball team pulled ahead to win the match, 25-22, and win the OAA Red game, 3-1. Kelly Pinner, head coach, added there was a lot of hitting errors during the fourth match. The girls lost the first match to Bloomfield Hills by a close 25-23. The Wolves came back in the next two games keeping their visitors from scoring more than 20 points with 25-16 and 25-14 scores. Jordan Newblatt had 14 kills, Alana Watlington had nine kills, and Hannah Cady had seven kills. Claire Nowicki had eight kills and four aces. Skyelar Jidas had five aces. Haley Stewart had 15 digs and Kelsey Schaldenbrand had 15 digs and 47 assists. The girls finished in second place at the Northville tournament on Saturday, going 4-1-1 for the day. They tied against Stevenson, 1-1, winning the first match 25-17 and lost the second match 26-24. Newblatt had seven kills and three assists, Watlington had six kills and five assists and Nowicki had seven kills. Stewart had ten digs and Schaldenbrand had seven digs. The Wolves defeated Trenton, 25-11 and 25-16. Nowicki had eight kills, Newblatt had seven kills and Watlington had five kills. Schaldenbrand had 24 assists. Skyelar Jidas had three aces and Abbey Tolmie had seven digs. The Wolves also went 2-0 against Cass Tech, 25-13 and 25-19; and Southfield Christian, 25-10 and 25-12. Against the Technicians from Cass Tech, Nowicki had nine kills as Watlington and Newblatt had seven kills. Schaldenbrand had three aces and 28 assists and Stewart had eight digs. 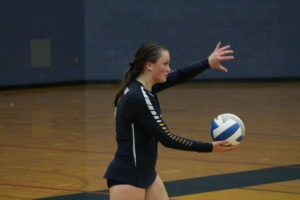 Against Southfield Christian, Newblatt had eight kills as Nowicki and Watlington both had seven kills each. Schaldenbrand had three aces and 25 digs and Stewart had ten digs. The Wolves moved on to defeat Northville in the semifinals, 2-1, as they won the first match, 25-12, lost the second match, 25-11; and won the tie breaker, 15-12. Nowicki had ten kills and eight digs. Newblatt had six kills. Watlington had three blocks. Schaldenbrand had six digs and 22 assists and Stewart had eight digs. The girls lost to Lake Orion in the finals, 2-0, with both matches ending 25-23. Watlington had five kills and four blocks, Newblatt had six kills and Nowicki had five kills. Stewart had 13 digs and Schaldenbrand had 18 assists. The Wolves opened their OAA Red play with a 3-0 win over Birmingham Seaholm, Sept. 13. The Wolves opened the week at Stoney Creek. Then, they host Lake Orion on Thursday. They head to Rochester Adams, Oct. 2. JV plays at 5:30 p.m., varsity follows.